When adaptive optical system is applied for laser beam control it is very important to know the beam parameters such as beam width, divergence angle, beam quality factor M2 etc. before and after correction. That is why the sensor making such estimations should be included in any laser adaptive optical system. This paper describes the sensor design, possibilities, the principals of measurements and itвЂ™s place in the whole adaptive optical system. Keywords: beam widths, beam quality factor M2, adaptive system. A good laser beam quality is necessary for many scientific and industrial applications for example for material processing. Different active medium inhomogeneities and turbulence of the air at the beam delivery path cause laser beam phase and intensity distortions and power instability. To improve laser beam parameters adaptive optical system could be used. In our group of Adaptive Optics for Industry and Medicine, ILIT, Russian Academy of Sciences we design and make commercially available adaptive optical system for correction of the wavefront aberrations and for formation of a specified laser beam intensity distribution. The main element of our adaptive system is a bimorph flexible mirror well described in Ref.1-5. For the wavefront analysis we use the Shack-Hartmann sensor. For the estimations of laser beam widths, divergence angle, beam quality factor M2, power instability we designed so-called M2-Sensor. The place of the M2-Sensor in the whole adaptive system infrastructure is shown in Fig.1. According to the International standard ISO11146 different methods of beam parameters determination could be applied6-10. In our case we use the direct method of beam parameters measurement. The more detailed scheme of the M²-Sensor and itвЂ™s photo are presented in Fig.2. 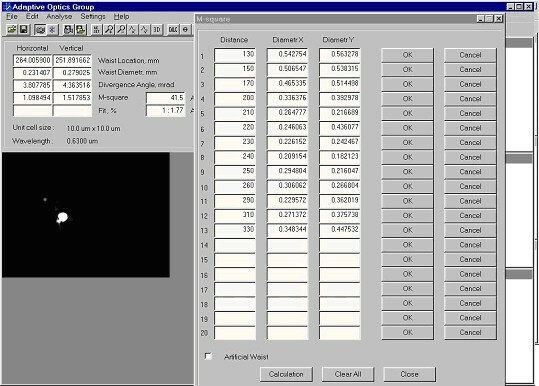 For elliptical beams the software includes the calculation of the azimuthal angle φ between the beam principal axes x', y' and the axis of laboratory coordinate system x, y (Fig.3). Then the definition of all the main beam parameters takes place in the principal beams axis direction. 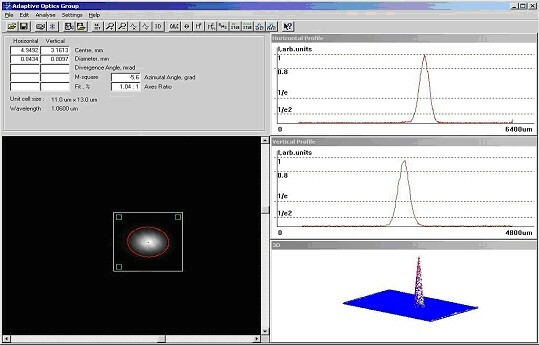 In order to reduce an influence of different expose signals it is possible to select an area of interest for calculations from the whole surface of the CCD window (Fig.4). To increase the accuracy of calculations the dark current of camera is subtracted from the image. Our sensor allows to define the beam quality factor M2 and divergence angle by two methods described in ISO11146 6. If the beam waist is not accessible for direct measurements the artificial waist should be created with the help of a focusing element and then the same measurements should be made around the artificial beam waist (fig.2). Fig.5 shows the realization of multiple measurements method by the software of our M2-Sensor. For laser applications sometimes it is useful to know gaussian or flat-top fit to laser beam intensity. For example, the last one is important during formation of the super-gaussian intensity distribution. Here Ireal(x,y) is the real intensity value, Igauss(x,y) is the calculated gaussian one, N is the number of pairs (x,y) used in fitting. If σ=0 then our beam becomes the gaussian. The more σ, the less the real intensity distribution function could be described by gaussian function. where W is the power distribution in one frame, is the averaged power of all frames measured per short time, N is the number of frames. Here is the short-term averaged power measured for a few seconds, is the averaged one measured for the compatible long time, N is the number of counts of . Fig.6 illustrates the oscilloscope option of M2-Sensor. The frequency of the measurements is 10 Hz. laser intensity instability - σ4. Error caused by laser intensity instability depends on the own laser characteristic. 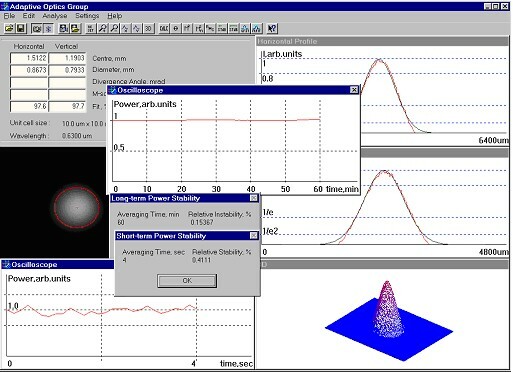 For example for LGN-302 He-Ne laser this error is σ4=0.01%. According to International Standard ISO11146 the admissible mistake for beam parameters calculation is σtotal=10%. Two He-Ne lasers were taken for testing of the M2-Sensor: LGN-302 and LGN-207Рђ. The obtained results are presented in Table 1. All parameters were determined along x and y laser beam directions. Short-term and Long-term stability of the beam intensity. All the measurements correspond to the International Standard ISO11146. A.V. Kudryashov, V.V. Samarkin, вЂњControl of high power CO2 laser beam by adaptive optical elementsвЂќ, Optics Communications 118, pp.317-322, 1995. T.Yu. Cherezova, S.S. Chesnokov, L.N. Kaptsov, A.V. Kudryashov, вЂњDoughnut-like laser beam intensity output formation by means of adaptive opticsвЂќ, Optics Express 155, pp.99-106, 1998. T.Yu. Cherezova, L.N. Kaptsov, A.V. Kudryashov, вЂњCW industrial rod YAG:Nd3+ laser with an intracavity active bimorph mirrorвЂќ, Applied Optics 35, pp.2554-2561, 1996. A.V. Kudryashov, V.I. Shmalhausen, вЂњSemipassive bimproph flexible mirrors for atmospheric adaptive optics applicationsвЂќ, Optical Engineering 35(11), pp.3064-3073, 1996. T.Yu. Cherezova, S.S. Chesnokov, L.N. Kaptsov, A.V. Kudryashov, вЂњSuper-Gaussian output laser beam formation by bimorph adaptive mirrorвЂќ, Optics Communications 155, pp.99-106, 1998. Test method for laser beam parameters: Beam width, divergence angle and beam propagation factor, Document ISO/DIS 11146, International Organization for Standardization, 1996. P. Belanger, Y. Champagne, C. Pare, вЂњBeam propagation factor of diffracted laser beamsвЂќ, Optic Communications 105, pp.233-242, 1994. T. Jonston, вЂњBeam propagation (M2) measurement made as easy as it gets: the four-cuts methodвЂќ, Applied Optics 37(21), July 1998. A.E. Siegman, Solid State Lasers: New Developments and Applications, pp.13-28, Plenum Press, New York, 1993. K. Roundy, вЂњPropagation factor quantifies laser beam performanceвЂќ, Laser Focus World 12, pp.119-122, 1999.